WASHINGTON, D.C. -- The percentage of Americans who believe the death penalty is applied fairly continues to decrease, falling below 50% this year for the first time. Forty-nine percent now say the death penalty is applied fairly and 45% say it is applied unfairly. 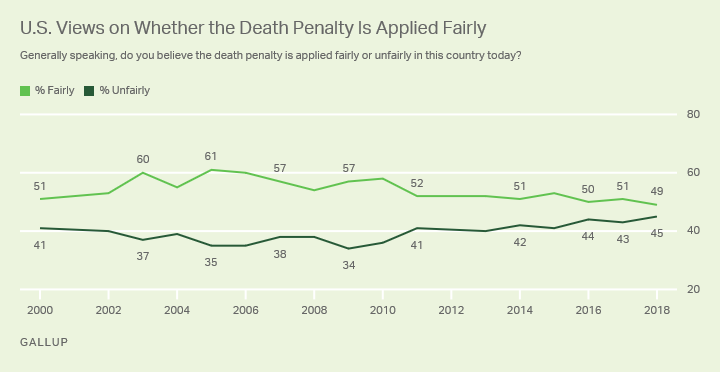 The 49% who say the death penalty is applied fairly is, by one percentage point, the lowest Gallup has measured since it first asked the question in 2000 and reflects a gradual decline of this view over the past decade. 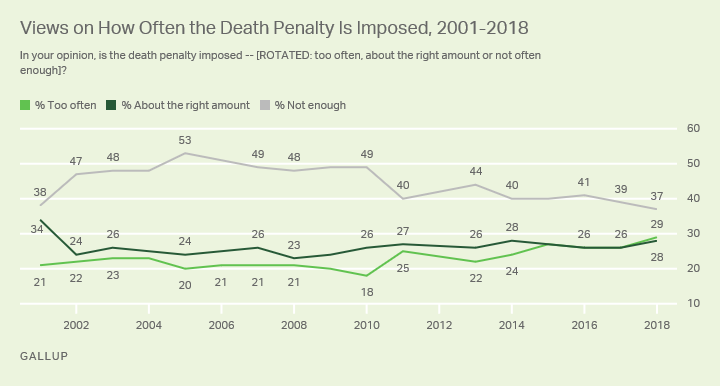 Meanwhile, the percentage who say capital punishment is applied unfairly has edged higher, with this year's four-point gap marking the smallest difference between the two views in Gallup's polling. These latest data, from Gallup's annual Crime poll, were collected Oct. 1-10 -- just before the Washington state Supreme Court on Oct. 11 struck down that state's death penalty, saying it had been unequally applied across racial groups. In its decision, the court cited evidence that "black defendants were 4 ½ times more likely to be sentenced to death than similarly situated white defendants." The decision makes Washington the 20th state to outlaw the death penalty. The decline in Americans' belief that capital punishment is applied fairly is largely the result of a sharp drop in this view among Democrats. 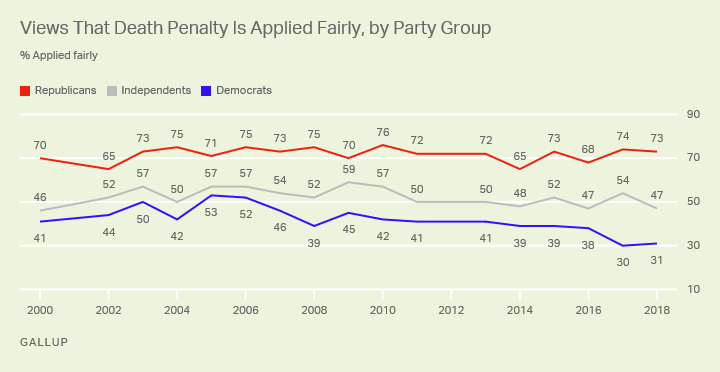 Thirty-one percent of Democrats this year say the death penalty is applied fairly, similar to the low of 30% in 2017 but down significantly from 2005 and 2006, when slim majorities held this view. 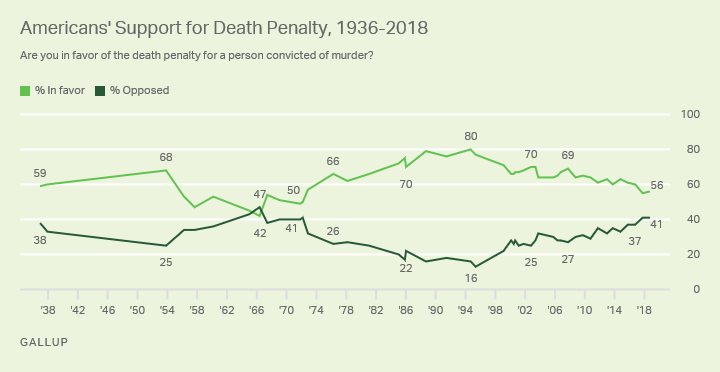 Meanwhile, 73% of Republicans say the death penalty is applied fairly, and the percentage holding this view has been fairly stable over time -- typically in the low 70s. More Americans Say the Death Penalty Is Imposed "Too Often"
Americans remain most likely to say the death penalty is not imposed enough (37%), while smaller percentages say it is imposed "too often" (29%) or "about the right amount" (28%). While belief that the death penalty is not imposed often enough is still the most common view, the latest 37% is down from a high of 53% in 2005 and is by one point the lowest reading since 2001. At the same time, U.S. adults have gradually become more likely to say capital punishment is imposed "too often," with the latest 29% slightly higher than in previous years. Historically, Americans have been generally supportive of the death penalty as the punishment for murder. In all but two polls (in 1965 and 1966), Americans have been more likely to say they are in favor of than opposed to use of the death penalty. However, support for capital punishment too has been trending downward since peaking at 80% in the mid-1990s during a high point in the violent crime rate. Washington is the latest in a string of states that have outlawed the death penalty over the past decade. 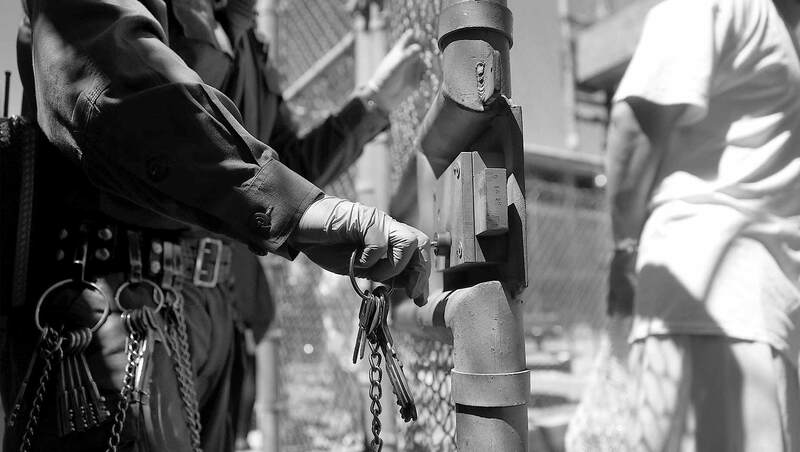 While courts sometimes drive abolishment, as was the case in Washington, most abolition of the death penalty in recent years has taken place via legislation by state lawmakers and governors, who are beholden to voters and public opinion. So, if public support for capital punishment continues to wane, it's not unfathomable that other states could follow suit. Some Americans' views on the subject may have been influenced by stories of people sentenced to death who were later found to be innocent. In a 2014 poll, Gallup found that about one in six people who were opposed to the death penalty said they were against it out of concern that the defendants might actually be innocent. Other news stories, such as a case in Alabama earlier this year involving a botched execution, may have influenced opinions on the issue. Future support for the death penalty may depend partly on whether crime continues to decrease, because support for capital punishment peaked along with U.S. violent crime statistics, and as crime statistics declined thereafter, so did support for capital punishment. Meanwhile, as executions in the U.S. have decreased along with the generally sinking crime rate, Americans have become more likely to say capital punishment is unfairly applied and that it is imposed too frequently. But this appears to have been driven mostly by shifts in Democrats' views on the subject -- with blue states far more likely to have abolished the death penalty.